Making Coffee Cake: it does get better over time! Do I try? Do I make an effort? Am I also humble enough to admit when I fail? 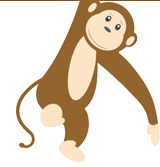 Am I will to persevere and keep trying? Case in point: streusel topped coffee cake. 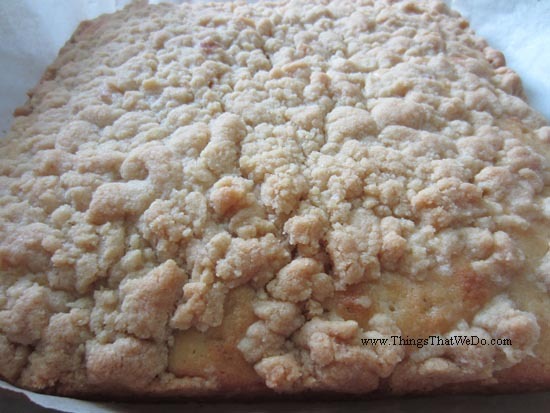 I’ve always loved those streusel topped coffee cakes that you get from the grocery store. The crunchy bits on the top are my favourite. 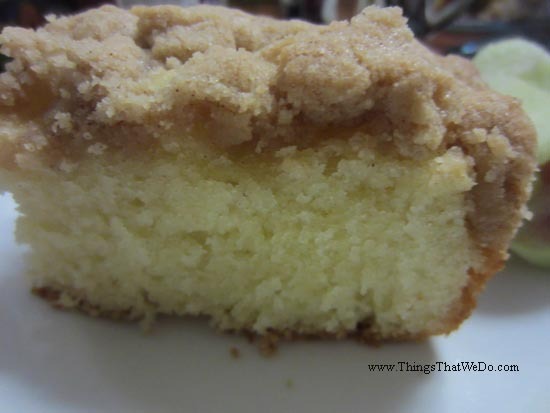 What I didn’t like was how sweet the store bought coffee cakes were. The excessive use of sugar seemed to overwhelm all the other flavours in the coffee cake. The December 2015 coffee cake tasted delicious but the streusel topping obviously needed a little work. 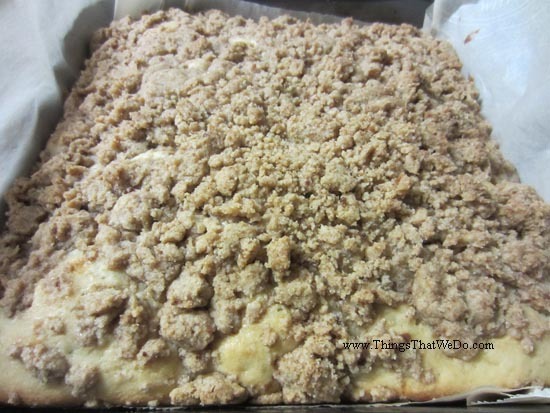 In November 2015, I even tried my hand at adding some apple chunks into the coffee cake recipe. Although it looked decent enough and it tasted fine, it just wasn’t a big hit in the home. Looking back at those photos made me realize just how much my streusel coffee cake has improved over the years. I apologize that I don’t have the same number of baking photos to share as I normally do. I only took photos of the finished streusel coffee cake that I had made recently because I was so happy with how it had turned out. I figured I’d already posted the recipe on the site ages ago! Combine the streusel toppings together and set aside. In another bowl, combine all the dry ingredients for the coffee cake together (ie. the flour, baking powder, and salt). Set aside. Then, in a separate big bowl, beat the butter until it’s light and fluffy. Add the sugar and continue to cream together. From there, add the eggs and beat together well. Mix in the vanilla and milk. From there, add the dry mixture to the wet mixture. Slowly fold in the dry ingredients until incorporated and pour into a parchment lined 9 x 9 container. Now comes the fun. When I had the streusel topping, I find it best to make clumps and top the coffee cake with it. Those clumps are going to take so decadently rich with a slight crunch when the coffee cake is done. That’s something I figured out along the way. Bake at 350 degrees for about 20 – 25 minutes (maybe more or less depending on your oven). Test the cake by poking in a toothpick. If it comes out clean, you’re done. It should also have a nice light golden look. On this particular occasion, I left the coffee cake in the oven for a few more minutes and the final result was fantastic. After all these years, I’m still trying to figure out how to better use my baking pans and the oven. This time, the coffee cake turned out excellently. Even the family was impressed! The cake was soft and flavourful without being too sweet. According to the hubby, the streusel topping was crunchy, buttery, and slightly sweet. 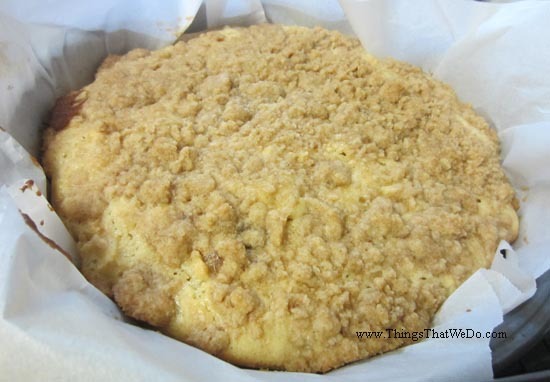 Personally, I like my version of the streusel coffee cake because I can actually taste the cake without being hit over the head by the excessive sugar. It allows me to enjoy the streusel topping more because I’m not distracted by the sweetness. Funny how that happens: I’ve used the same recipe year after year and somehow along the way, the streusel coffee cake started to taste better and better. Needless to say, the streusel coffee cake didn’t last long.